Can you put Pyrex in the oven? Yes, you can because Pyrex glassware is designed to be used in the oven up to 4500F. Safety measures, however, need to be considered to ensure the safe use of Pyrex in the oven. Pyrex glassware always comes with an “Always preheat oven” instruction. This means that before placing a Pyrex dish in the oven, it should already have reached the desired cooking temperature. When you preheat your oven the gas burner will run at full output generating a lot of radiant heat. When you place Pyrex dish inside the oven, radiant heat will increase the temperature of the food without directly altering air temperature. This will result in even cooking. 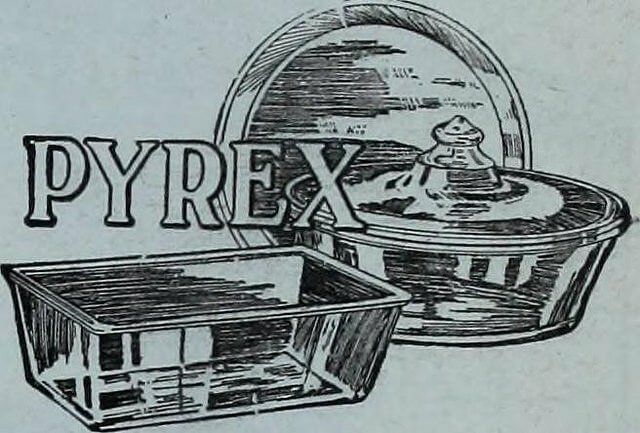 When on the other hand you place Pyrex dish inside an oven and just turn it on, some surfaces of your food will be exposed to radiant heat as the oven heats up and some surfaces will be exposed to the air temperature which is still colder. This will result in uneven cooking. A preheated oven will also not give Pyrex dish too much thermal stress which may cause it to explode. Allow Pyrex glass from the freezer to cool down to room temperature before placing in the oven. Pyrex, just like any glass dish is bound to break when exposed to extreme changes in temperature. If the food you are cooking in the oven on a Pyrex dish will be releasing liquid, place a small amount of liquid to cover the bottom of the Pyrex dish before placing it in the oven. This is to prevent cool liquids (juices from the food while cooking) to get into contact with the hot Pyrex. When the Pyrex dish already has some liquid in the bottom as you place it in the oven, the Pyrex dish and liquid will heat up together. This will, therefore, prevent cool juices from food negatively impacting the Pyrex dish. The metal burner of your stove seems to be the closest place to rest your Pyrex dish after taking it off the oven. While the metal eyes of your stove are heat resistant placing hot Pyrex on cool metal will make the hot dish shatter. When taking off Pyrex dish from the oven the best place to rest the dish is on a cloth or silicone hot pad, dry oven potholders or mitts, wooden cutting board or a folded dry towel. If you plan to use a metal spoon to serve food cooked in your Pyrex dish, allow your dish to cool down for several minutes. Digging in a room temperature metal spoon on a hot Pyrex dish may cause it to shatter. It is also important to note that the longer you use your Pyrex dish its special coating that makes it oven-safe is bound to wear off. The special coating is often taken off when you often scrub burnt-on food. Can you put Pyrex in the oven? Yes, you can up to 4500F. Following the safety precautions mentioned above will make you safely enjoy cooking food in the oven with your Pyrex dish. I’m Megan Ann, mama to 2 and wife to James F. Core. I love meeting new people and hearing their stories. In this blog, I try to write useful and informative articles to help you as much as I can with my knowledge. megananblog.com is a participant in the Amazon Services LLC Associates Program, an affiliate advertising program designed to provide a means for sites to earn advertising fees by advertising and linking to Amazon.com. *Amazon and the Amazon logo are trademarks of Amazon.com, Inc., or its affiliates. Additionally, megananblog.com participates in various other affiliate programs, and we sometimes get a commission through purchases made through our links. The medical information on the meganannblog.com website is provided as an information resource only and is not to be used or relied on for any diagnostic or treatment purposes. This information is not intended to be patient education, does not create any patient-physician relationship, and should not be used as a substitute for professional diagnosis and treatment. Copyright text 2017 by Megan Ann Blog.